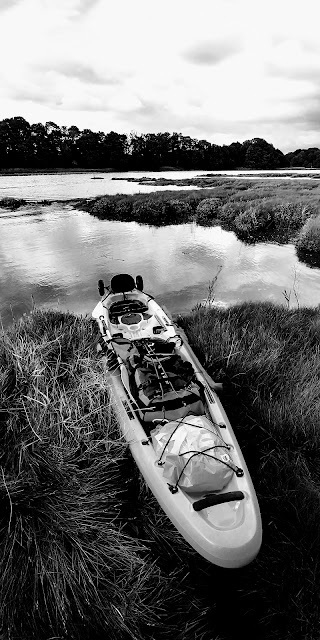 So the idea was, in planning and preparation for a longer trip, for Tom and I to take the paddle boards and lightweight camping kit down the river Hamble and practise our wild camping and paddling skills - but thanks to the purchase of a new kayak (for the family of course!) and the fact that the winds were picking up and would make SUP's a bit difficult to handle when fully loaded with kit we opted for both double kayaks; the real benefit here was that we could "overpack" without too much of an issue as we had carrying capacity aplenty! Tom's kayak is a Perception Gemini Scooter and mine is a Wilderness Systems Tarpon 135T - both double kayaks and great for the family - to explore the river and local coastline that we're so lucky to have around us.